The block diagram below shows the stages required to provide a crystal controlled signal source, AM signal detector and a heterodyne wavemeter. This is a useful instrument that can produce a wide spectrum of stable frequencies. The oscillator can run at 1, 2 or 10MHz. Temperature compensated or oven controlled oscillators will provide significantly improved frequency accuracy. 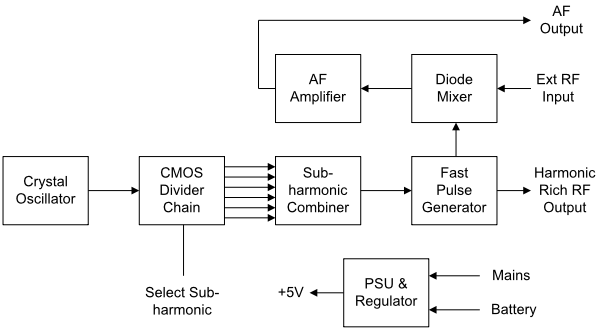 The CMOS divider chain should be selectable in steps of 2 and 5 so that the sub-multiple frequencies from say 1MHz will be in the form 500KHz, 100KHz, etc down to at least 5KHz. The sub-harmonic combiner should use very narrow pulses so as to improve the HF and VHF output levels. The fast pulse generator is used to produce high output levels at VHF. It can be a high speed switching device, 74S series IC or a step recovery diode. A sample of the output from the pulse generator is applied to the diode detector which acts as a mixer to provide an audio output equal to the difference between the RF Input signal and the nearest harmonic. The diode detector may also be used as an AM detector.